Knowing how to choose a healthy cooking oil can be confusing. There is so much contradicting information about fat. As a result, many people cook with the wrong kind of fats. In this article I look into the different monounsaturated, polyunsaturated and saturated fats and how temperatures effect each. I explain which fats you should avoid and why coconut oil is good for high temperature cooking. There are fats that are not healthy in general and shouldn’t be consumed. Other fats are good for you, but they are sensitive to heat. They actually become unhealthy when we cook with them. And some fats are healthy in both unheated and heated state. This is why it’s important to understand how temperature and other chemical reactions affect an oil. We need good fats, it’s as simple as that. They assist with many important body systems related to our brain, cells, heart, metabolism, blood, hormones, skin, digestion, teeth and lungs. Monounsaturated fats: found in avocados, olive oil, peanuts and other foods. Polyunsaturated fats: plant sources: nuts, seeds and vegetable oils. Animal sources: salmon, mackerel and herring. Saturated fats: animal sources: meat, dairy products and eggs. Plant sources: coconut oil, cacao butter and palm kernel oil. Trans fats: a result of chemical processing and bad for your health. You can find them in many processed foods such as fried foods, cookies, candies, some types of margarine and anything labeled (partially) hydrogenated. They raise bad cholesterol levels (LDL) and increase the risk of heart disease, diabetes and cancer. Let’s talk about what happens to fats when you heat them. If you follow a raw food diet, you can skip this part. For those of us who cook regularly; this is for you. A fat changes its property when you heat it. At some point it is prone to a chemical reaction called oxidation. Oxidation happens when fats interact with heat, oxygen, moisture and light. This results in harmful free radicals that can cause serious damage to our body, especially to the brain, heart and liver. Every oil oxidizes at a certain temperature. The key is to choose those fats that are most heat-resistant. 1. Oils high in polyunsaturated fats such as sunflower, soy and corn are very sensitive to heat. They oxidize easily and should not be used to cook with. ” Considerable evidence has accumulated over the past two decades that heated cooking oils, especially polyunsaturated oils, may pose several types of health risks to consumers of fried food and even people working near deep fat fryers. Vegetable oils such as soybean, corn, sunflower, canola, grapeseed and peanut are usually also heavily processed and already oxidized when you buy them. Unless they are organic, they contain chemicals and pesticides and are often genetically modified (GMO). It’s best not to use these oils at all. 2. Oils high in monounsaturated fats such as avocado oil and olive oil are more stable than polyunsaturated fats, but they are not recommended for cooking. It’s best to use them raw or to add them to warm food immediately after cooking. Extra virgin olive oil and sesame oil are exceptions to this and are safe for brief low temperature cooking. This is because they contain antioxidants which protect against oxidation. 3. Saturated fats such as coconut oil and butter are the most heat-resistant fats, which makes them safe oils for cooking. Use a good quality refined coconut oil for high temperature cooking or deep frying. It’s more heat-stable than unrefined or virgin coconut oil. 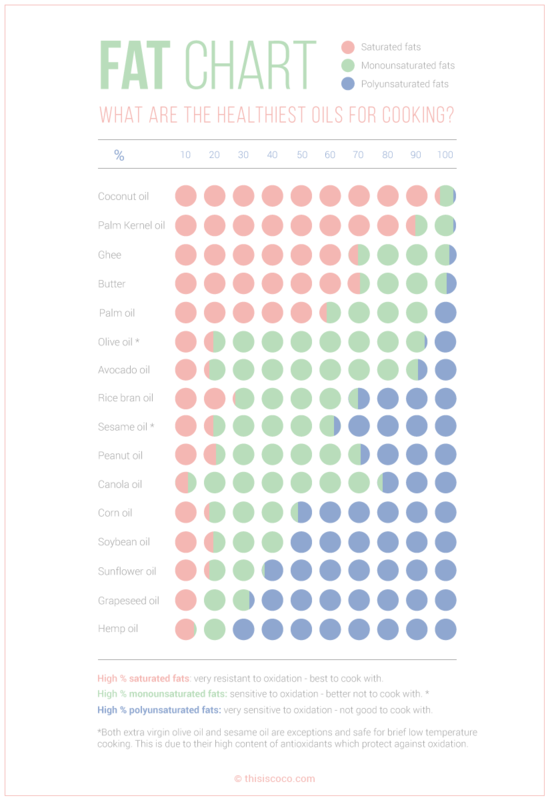 I designed this fat chart to help you better understand how much saturated, monounsaturated and polyunsaturated fat each cooking oil contains. It makes it easier to get the whole overview and choose a healthy cooking oil. Coconut oil consists of 92% saturated fat. That sounds like a lot, but it’s a good thing. It contains the highest amount of saturated fats of all cooking oils, which makes it very suitable for high temperature cooking. But this is not the only reason why coconut oil is a healthy cooking oil. The fatty acids in coconut oil called MCT’s (Medium Chain Triglycerides) contain many health benefits. Instead of being stored in the body, like most other fats, they are metabolized in the liver and immediately used for energy. Another part of them converts into ketones which are a valuable source of fuel for our brain, heart and muscles. Since MCT’s don’t get stored in the body and also help speed up your metabolism, they actually help burn fat. The MCT’s antiviral, antimicrobial, antifungal and antiparasitic properties help destroy viruses, bacteria and fungi. They assist in body detoxification which is so important for good health. MCT’s also help with the absorption of important fat-soluble vitamins A, D, E and K.
So when you’re making a green leaf smoothie or a mango shake, adding a bit of coconut oil to it will help you get the maximum nutritious value! Coconut oil is a versatile oil that can be used for cooking, frying, baking and other high temperature food preparation. And you can of course use it unheated as well. Lauric acid forms about 50% of the MCT’s in coconut oil. Coconuts are the main plant-based source of lauric acid found in nature. Another source of lauric acid is a component of breast milk. The first and essential building source of babies born into this world. Lauric acid makes coconut oil so heat-resistant. The other MCT’s capric acid, caprylic acid and caproic acid are not heat-resistant. There is a type of chemically processed coconut oil named liquid coconut oil which has the lauric acid removed. This is why it stays liquid even when refrigerated. 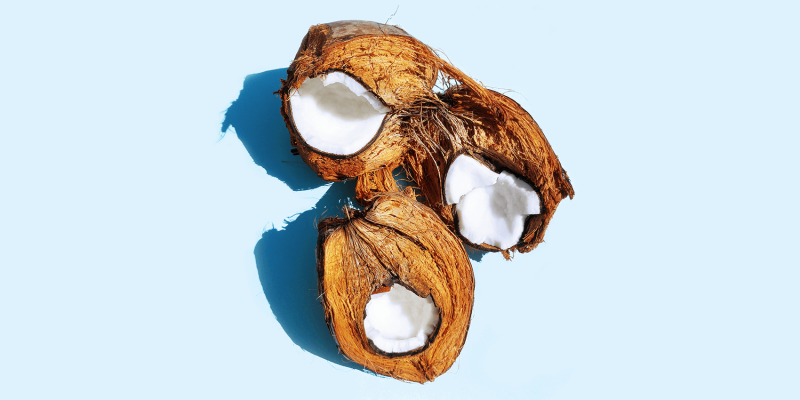 While it might seem convenient that it’s always liquid, the natural property of coconut oil is to solidify at low temperatures and to melt at high temperatures. Without the lauric acid, it ceases to be heat-resistant. This type of coconut oil actually isn’t real coconut oil anymore and is not suitable for high temperature cooking or cooking in general. Liquid coconut oil is a confusing product name, because coconut oil does get liquid naturally when temperatures rise. It has a melting point of 24° C / 76° F and it can easily go between solid and liquid without going bad or altering the oil’s quality. My advice is to always read labels and only use high quality coconut oils which are naturally heat-stable. Good fats are essential for our health. We need them for proper functioning of our brain, bones, cells, muscles, blood, hormones, skin, digestion, teeth, lungs and metabolism. They also play an important role in the absorption of vitamins and minerals. Some oils are healthy when unheated, but this doesn’t mean that they are suitable as a healthy cooking oil. 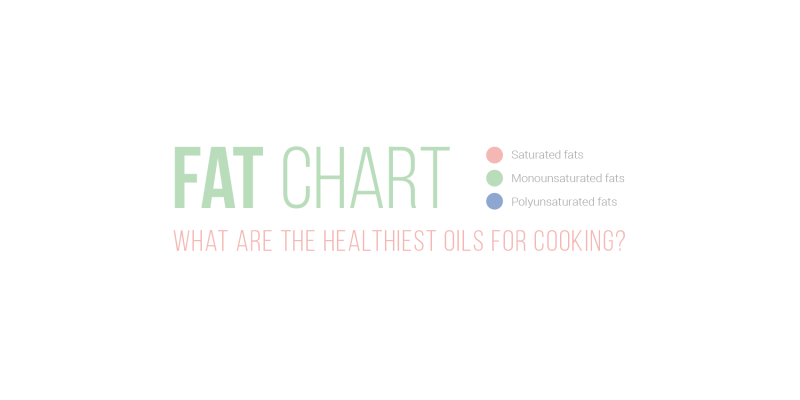 The most heat-stable cooking oils are those who contain a large amount of saturated fats. Oils high in polyunsaturated fats are very sensitive to heat and should not be used to cook with. Coconut oil is a multi purpose oil that can be used for cooking, frying, baking and other high temperature food preparation. Like with all products; use in moderation and with good sense for a well balanced, healthy diet! I wrote this article about how to choose a virgin coconut oil. And here I explain about refined coconut oil which is great for high temperature cooking, but you need to know which one to buy as the differences in quality are very big. I recommend this scientific article by M. Grootveld, C. Silwood, P. Addis and M. Viana. You can download the PDF for free on ResearchGate.